Indian cow may extinct if slaughter is permanently prohibited. The slaughtering of cows has been prohibited in India which means cows will only die from natural causes. This situation is something new. The total number of cattle is 191 million as per 2012 livestock census. The Indian livestock department estimates that the number in 2017 has been decreased to 167 million. As there is no accurate data for the number of cattle, the Government has planned to identity cards with 12 digit unique numbers to 88 million cows. The government has the plan to cover total population cattle with this identity card scheme. It is no doubt in anybody’s mind that there will be billions of dollar loss due to this ban. However, I will not go into socio-economic consequences for the ban of slaughtering. I am trying to find out how the slaughtering will affect the number of population of the cattle in future. To raise and take care of a cow is very expensive and it requires hard labor. 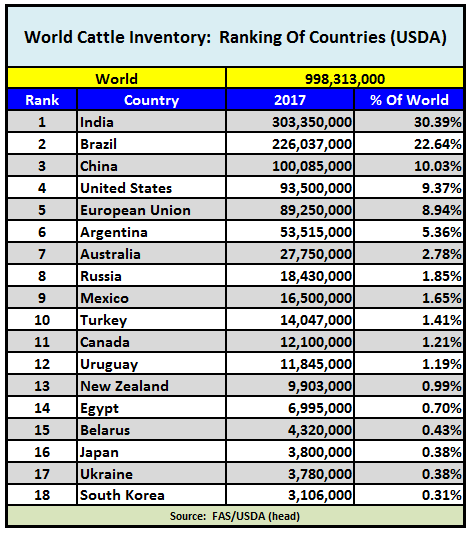 Let us say, there are currently 200 million cattle in India. One-third meaning 66 million cows are male. Since Indian agriculture has been modernized, there is no need of male cows. Tractors have replaced male cows. People are not allowed to sell cows for slaughter. Some those tried to slaughter cows secretly were brutally murdered by local cow protection groups. Who dares to do it again!. Nobody wants to have male cows for sure. There are already many ownerless cows in the Indian streets. There are also many incidents cows are destroying crops. If the Government strictly follows the slaughter ban for some years, nobody will be interested to feed and take of cows. These cows have not learned to live without human care. If human care is withdrawn, the number of cows will start to decline sharply. I don’t think, cows will extinct. If cows are released in nature, many will die from diseases or shortage of food. But those will survive will adjust nature and environment. They will be stronger. They will start reproduction in nature. It can take several generations but the cow species will survive. But this survival may devastate the green nature.